The Transmatic 6560 SPORT is specifically designed for digital dye sub printing of apparel and other industries that require cut panels or engineered prints. A new self contained, oil heated drum system assures uniform heat across the width of the cylinder and the lowest possible power consumption. Transmatic oil heated drum system use 50 % less electric power than all electric machines. Drum size available- 61 cm / 24” to fit all the needs of the digital industry. 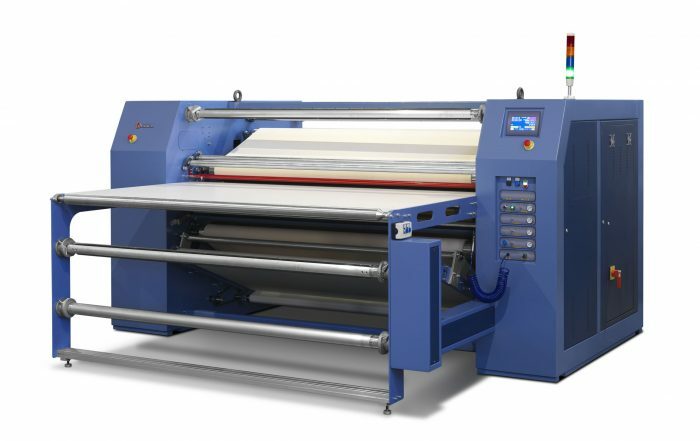 Traditional printing of continuous fabric and transfer paper roll to roll. Transmatic heat presses with the new oil heated drum system will increase production, reduce seconds, and save on energy costs. High productivity, quality engineering design and conscientious after- the sale service are all good reasons for investing with TRANSMATIC for all needs in dye-sub printing or textile dye fixation.